The future of work is changing and software robots are assisting enterprises in their day-to-day operations from logistics, finance and accounting, mortgage lending, customer onboarding, and more. 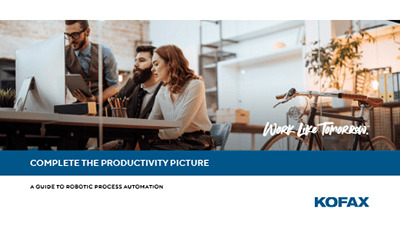 Kofax RPA transforms the way your company collects and processes digital information. With an effortlessly scalable robotic workforce, you can automate a single use case or deploy and scale across your organization.